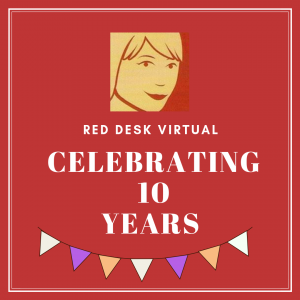 Red Desk is 10 years old! We actually had our milestone birthday in November 2018 but in the run up to Christmas we decided to save the celebrations until 2019. This article celebrates the successes of running a small business for 10 years. Back in November 2008, Lindsay was flying solo. Having undertaken a Virtual Assistance course with blue umbrella, Lindsay is one of the few that attended the course that is still running her own VA business. Despite being a Virtual Assistance company, we pride ourselves on the fact that many of our clients are local so that we can pick up any paperwork or have a face to face meeting when needed. It was in fact one local client who needed help back in 2012 which led to Red Desk expanding from a solopreneur to a partnership. Back in 2012 Mel was hoping to return to work after maternity leave and was looking for flexible work to fit in with childcare. Having seen Red Desk’s advert and column in The Muswell Flyer, she thought that being a Virtual Assistant might be the answer. After a chat with Lindsay, this led to helping out a local client with getting their printer to work when Lindsay was on holiday. The rest they say is history! One of the things you soon quickly learn about running your own business is that you have to work hard at getting clients. 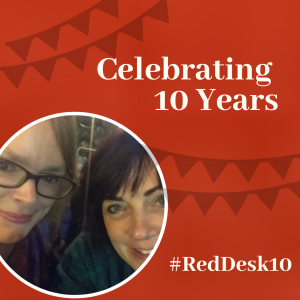 All the VA s at Red Desk have been to a networking event in their time and both Lindsay and Mel were members of networking groups which were responsible for obtaining a key number of clients and contacts. Although we are no longer members of a networking group, we still see the merits of networking. As well as networking, another way of business exposure for Red Desk was our relationship with North London magazine editor Becky Beach. Having advertised and had columns in the magazines for a number of years, it established our expertise as support to freelancers and small local businesses. The magazines are read by busy executives who often didn’t have time to look at our website or online marketing campaigns. Over the years both Lindsay and Mel have developed a talent and passion for running social media campaigns from recruiting new beginners for sports clubs right through to advertising international book fairs. This is now the main focus of our business although we still have virtual assistants to take on other tasks when required. As our confidence in our social media expertise grew, we have been asked to work with a number of organisations including the Islington Youth Council and London Grid for Learning. Although Red Desk remains at two directors, we have a number of Virtual Assistants that we call on for various projects, enquiries matching their skillsets or holiday cover. This does make us more unique as most Virtual Assistants work on their own but our model allows us to bring in additional help when needed. We have made some great contacts over the years, people that have become an important part of our extended network. For webdesign we always turn to Andy Kinloch of N8tive, we also have a wonderful graphic designer – Tracey Goodland of Design is Good. Red Desk has also been very much involved with the local community of Muswell Hill as part of the community group Friends of St James Square . We have helped bring several events to Muswell Hill, bringing some fun & community spirit to the local area, to celebrate this wonderful part of London. We’d also like to say “Happy Birthday” to Creative Writes who are also celebrating their 10th birthday this year.